Nearly two-thirds of registered voters (64%) received recorded telephone messages in the final stages of the 2006 mid-term election. 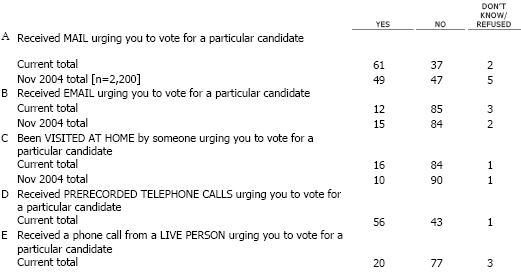 These so-called “robo-calls” were the second most popular way for campaigns and political activists to reach voters, trailing only direct mail as a key tool of political communication. Some 71% of registered voters got direct mail campaign solicitations, while 24% received phone calls from real human beings urging their vote for a particular candidate, 18% were visited at their homes, and 14% received email solicitations. People with clear partisan leanings, both Republicans and Democrats, were more likely to be solicited through any contact channel, compared with those who say they are independents. However, conservative Republicans were more likely to have received phone calls of any kind (live or recorded) than were liberal Democrats and moderates in both parties. This election was the first time that the post-election survey by the Pew Internet & American Life Project and the Pew Research Center for the People & the Press has asked about telephone contacts with voters. So, there are no data from previous years allowing comparisons that might show how much the number of robo-call recipients had grown from previous elections. Even though this was a mid-term election, there were increases in some of the other kinds of voter contacts compared with what happened in the 2004 presidential campaign. Some 49% of American adults got direct mail contacts from candidates in 2004, compared with 61% this year. And 10% of American adults were visited in their homes by political activists in 2004, compared with 16% this year. In contrast, the number of Americans getting email political solicitations dropped slightly from 15% in 2004 to 12% in 2006. This trend towards higher levels of political communication with the public probably reflects the fact that more congressional races and gubernatorial were contested this year than in 2004. It might also result from the increasing sophistication of campaigns in identifying voters they want to get to the polls on Election Day. Indeed, campaigns and activists were more likely to direct communications to those who are traditionally more likely to vote. For instance, Americans who have college degrees were more likely to get all types of political communication than were those who have high-school diplomas; those living in households with incomes above $75,000 were more likely than those in households earning less than $30,000 to receive most forms of communication; and middle-aged and older Americans were more likely than those under age 30 to be the target of all forms of communication, except emails. The Project is a non-partisan initiative of the Pew Research Center that researches the social impact of the internet. The Project has no policy agenda and takes no positions on internet-related issues. Q2 In the past two months, have you…?